Facilities caring for children frequently include a child check-in process to keep the kids in their care safe. These processes range from the use of pen and paper to an electronic system with kiosks, a dedicated check-in area, or mobile equipment. Organizations are regularly expected to expand past these initial check-in offerings, to support new growth and keep current, tech-savvy families engaged. 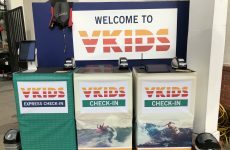 Even with a check-in process in place, challenges can still exist including congestion and long check-in lines, a lack of efficiency, and parents who are frustrated or simply won’t engage in the check-in process. A check-in system can be less efficient when it’s tied only to a fixed station. 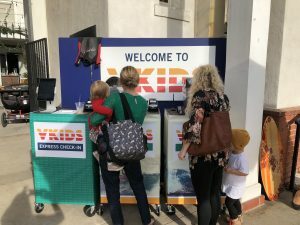 Incorporating a mobile component, which allows parents to check children in with their own device, along with the traditional setup creates an increase in flexibility, efficiency, and time available to connect with new and returning families. 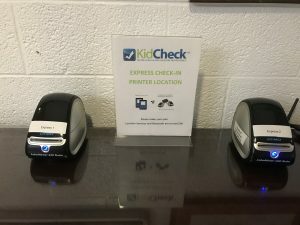 KidCheck Express Check-In allows parents to start check-in on their mobile device from home, the car, the parking lot or wherever there’s an internet or cellular data connection. When a family arrives, they simply tap the ‘submit’ button to complete check-in. The PrintHub Express immediately recognizes the check-in and prints the labels. It’s fast affordable and solves many of the challenges organizations experience today. During peak times, organizations often face a backlog of families trying to check-in. This congestion occurs due to issues ranging from facility design to a lack of physical systems to accommodate the influx of families, or simply many families showing up all at once. Whatever the challenge, bottlenecks happen. Families are busy, and parents take the brunt of responsibility for getting their children ready to go and out the door promptly. For most families, the craziness often raises the anxiety levels and lowers tolerance for delays. By providing a mobile check-in process that’s easy to follow, quick, and initiated at a time that is convenient for them, parent satisfaction increases and and the burden of feeling short on time lessens. Organizations using KidCheck Express Check-In can attest to this. Efficiency means doing things the right way, achieving more with less, or utilizing what you have differently to achieve a better outcome. Express Check-In not only increases efficiency but also creates a more effective use of resources. Incorporating mobile into the current check-in process is easy. KidCheck Express Check-In is fast and seamless for both families and organizations. Reduce check-in lines, increase parent satisfaction, and improve efficiency. Give families the ability to check-in when, where, and how they prefer. Learn more about Express Check-In.